The Milwaukee Brewers this weekend are honoring the 1982 team on the 35th anniversary of that team winning the American League championship. Here’s a handful of stats you may not know about that team. The 1982 Brewers won 95 games, tied with the 1979 Brewers for second most in club history. Most wins by a Brewers team is 96 by the 2011 Brewers. The ’82 squad scored 891 runs, second most in team history. The franchise record for runs scored is 894 by the 2011 Brew Crew. Buck Rodgers started the season as the Brewers skipper in 1982 and was fired with the team supporting a very mediocre 23-24 record. Harvey Kuenn was hired to replace Rodgers and the team finished the season 72-43. The Brewers in 1982 had three players collect 200 or more hits in the season: Robin Yount with 210, Cecil Cooper with 205 and Paul Molitor with 201. The team had never had two players before (and after) that season get 200+ hits in a season. The ’82 Brewers are one of 12 teams in MLB history to have three players with 200+ hits in a season. The 1929 Phillies and 1937 Tigers hold the league record with four players with 200+ hits for a team in a season. The ’82 Brew Crew also had four players with 100 or more RBI: Cooper (121), Yount (114), Gorman Thomas (112) and Ben Oglivie (102). They are one of 24 teams in baseball history to have four players with 100 RBI in a season. The 1936 Yankees hold the MLB record with five players with 100+ RBI. There was no 20-game winner on the 1982 Brewers. Pete Vukovich led the pitching staff with 18 wins… Mike Caldwell was second with 17 victories. The Brewers in 1982 were 8.5 games out of first place on June 9. That was the furthest out of first they were that season. 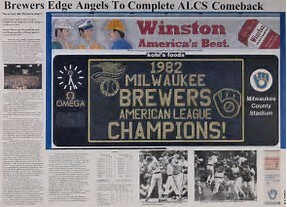 The Brewers entered the final series of the ’82 campaign with a four-game series in Baltimore. Prior to the series they were 3-6 against the O’s in 1982. The Brewers lost the first three games of that series before winning the final game of the series (and the season) to win the division. The Brew Crew in 1982 had a .588 winning percentage on the road and .585 at home. Putting runs on the scoreboard was important to the ’82 Brewers. Consider this: In games that season where they scored three or fewer runs, the team was 12-47 (.203 winning percentage). In games that season when they scored seven or more runs in a contest the team was 56-4 (.933 winning percentage). The Brewers led the league that year in home runs hit (216), most saves (47) and most double plays turned (185). The longest losing streak the club had that season was five games (that occurred from April 14-18.